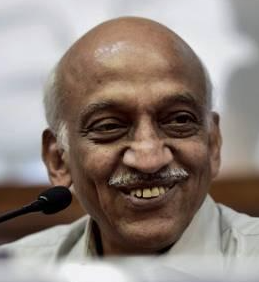 Indian Space Research Organisation (ISRO) chairman A S Kiran Kumar says the space body is working on new technologies and space programs, especially for interplanetary missions. In an exclusive interview to Times Of India's Surendra, Padma Shri awardee Kiran Kumar explains reasons as to why India, despite having so many remote-sensing satellites in orbit, is still taking help from NASA to keep an eye on the Doklam plateau, the site of the ongoing stand-off with China. ISRO this year has achieved several milestones — starting from the launch of 104 satellites in one go to the launch of heaviest rocket GSLV Mark III on June 5. How do you see these achievements? We need a lot of payload capacity (satellites) for various activities. We have to make sure we achieve the required capacity as early as possible. Towards that we have been working on. What are new technologies ISRO is working on? We have done the first development flight test of capacity launcher (GSLV MkIII launch on June 5). We will repeat its launches to make it operational. We are also working on semi-cyrogenic engine for the launch vehicle — making use of liquid oxygen and kerosene as fuel. We are also trying to streamline activities of satellite launchers. We'll see eight PSLV launches and two GSLV Mk II and Mk III launches in coming months. We are also working on the next phase of the reusable launch vehicle whose experimental test is likely within one to five years. ISRO is also building high throughput satellites like Gsat-11, Gsat-29 and Gsat-20 with high beam (a special kind of transponder that operates on a high frequency) that will increase our communication capabilities. We are also trying to improve weight capability of our satellites with the help of electric propulsion technology (which helps a satellite reduce its conventional fuel intake and instead draw energy from solar energy in space). Gsat-9 (South Asia satellite) has this technology. With a space agency launching its first rocket brought on a bicycle in 1963 to one launching the country's heaviest rocket, how do you see this advancement in space technology of ISRO? Our focus on indigenous development of space technologies, which were not easily available, helped us come this far. We have been consistently pursuing to achieve these technologies. Persistence definitely pays. What have been the hardships faced by ISRO? Initially, ISRO had faced the problem of developing cryogenic engine and also witnessed a couple of GSLV failures. This hurdle actually delayed the GSLV Mk II and Mk III programs. ISRO had successfully launched Mars Orbiter Mission and Chandrayaan in first attempt and at a budget less than that of NASA for similar missions. Is our technology cost-effective? We are trying to achieve more within the resources available to us. Our methodology is different from other countries. But we have also benefitted from what others had done. With ISRO launching 209 satellites of 28 countries since 1999, do you think it has made an impact in the commercial market? Money that we are earning from satellite launches is small. But what is significant is ISRO has made a mark in the small satellite launch market — those ranging from less than 100 kg to 500 kg. PSLV-class of launch vehicle is not available every where. And as we are engaging in frequent launches and have the capacity to carry small foreign satellites along with our primary satellite, PSLV is the best choice available in the market. By carrying small foreign satellites, we are also able to cut the cost of launches. Globally, small satellites are becoming the order of the day. What about India's space collaboration with the U.S. and Israel? Individual space agencies, including NASA, are not getting enough funds from their respective governments for their space programs. Collaboration between space agencies is, therefore, the order of the day. India and NASA are currently working on NISAR (NASA-ISRO Synthetic Aperture Radar) project. With PM Narendra Modi's special focus on technology, do you think the space budget allocated by the Centre is sufficient enough for ISRO? Progressively, the budget for space programs is being increased. In the last three years, the outlay has been increased. With the resources available to us, we will prioritize missions. ISRO had placed a lot of remote sensing satellites in orbit, then why does India have to depend on high-resolution images from NASA to keep an eye on the India-China military stand-off at Doklam? It is not possible for ISRO to look at all locations of the country 24x7. For example, if one satellite covers an area of 10 km once a day, how will you scan the total area of the country in a day. Therefore, by pooling resources (with images from NASA), we can get what we want.